A bounty of chicken, carrots, burdock root, lotus root and other ingredients with a light and elegant seasoning. 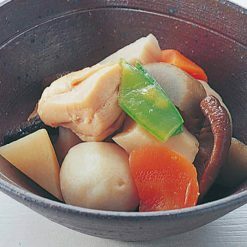 Chikuzen-ni (literally “Chikuzen stew”) is so called because of its origins in the area of what was once Chikuzen Prefecture (now Fukuoka Prefecture). The main ingredients in our Chikuzen-ni are all cooked separately from one another, and its seasonings include katsuo (oceanic bonito) dashi soup stock. The chicken meat in this item is Sugarlady Chicken, which is raised with no therapeutic chemicals or antibiotics. The chickens are Akadori variety chickens, and consume feed which does not contain hormones or genetically modified crops. Similar commercially available items use chemical seasonings, and because their ingredients are cooked together the fragrance of the shiitake mushrooms often transfers to the other vegetables, causing them to lose their individual flavors. Burdock root is not commonly seen in Western cooking, but is quite popular as an ingredient in traditional Japanese foods. Burdock root contains antioxidants, and is good for your liver. Pregnant women and those with allergies to ragweed, daisies, and/or chrysanthemums, however, should not eat burdock. Without defrosting the Chikuzen-ni, use scissors to make a cut in the end of the bag for air to escape; then place in the microwave.Approximate cooking times: 2 minutes in a 500W microwave, or 1 minute 30 seconds in a 600W microwave.Chikuzen-ni is a popular New Year’s food, but can be enjoyed at any time of the year! 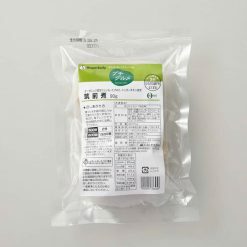 This product contains vegetables (organic taro, carrots, burdock root, organic bamboo shoots, lotus root, snow peas), hon-mirin, chicken meat, soy sauce (contains wheat), dried shiitake mushrooms, sugar, refined sake, flavor (katsuobushi, kombu seaweed, chili pepper).. Origin of ingredients: taro/carrots/burdock root (China). Prepared and packaged in Japan.